WHAT WILL MICHIGAN VOTE RECOUNT COST MICHIGAN'S TAXPAYERS? 4 TO 5 MILLION DOLLARS! $4,000,000.00 TO $5,000,000.00! SOME ESTIMATES SAY UP TO $12 MILLION DOLLARS! $12,000,000.00. THAT'S ALOT of ZEROES FOR A VOTE RECOUNT THAT WILL ACCOMPLISH...well...ZERO! CHANGE NOTHING. HUH! It's the Most Wonderful Time of the Year! Holiday Season. Christmas. GIVE MICHIGAN TAXPAYERS A BREAK! Over 1000 U.S. Jobs Saved! Future President Donald Trump Speaks With Carrier Air Conditioner Workers At Carrier Factory Plant Over 1000 Jobs Staying in Indiana. Over 1000 American Jobs saved! Indiana Carrier Plant Conversation with Workers - Future President Donald J. Trump, Thank You State Tours Donald Trump VP Mike Pence, Trump Tower live stream. Donald Trump Mike Pence Thank You Tour Cincinnati Ohio 12-1-16 America's First Non-Politician Businessman President Elect Donald Trump VP Mike Pence Thank You Tour Cincinnati Ohio December 1 2016. Michigan Attorney General Bill Schuette On Duty Twitter Michigan Attorney General Bill Schuette Twitter. Michigan Recount News here. Guy Gordon Talks to Mark Brewer About Why Jill Stein Wants to Submit a Recount-11-30-16 Mark Brewer served as Chair of the Michigan Democrat Party 1995-2013 and is a member of the Democrat National Committee. The Paul W. Smith Show WJR 760 am Interviews iTunes Guest interviews concerning Michigan Vote Recount are among the interview listings. Media Release: Michigan Secretary of State Ruth Johnson Update Regarding Michigan Presidential Election Recount December 1, 2016 Just saw this Michigan Secretary of State Twitter concerning Michigan Recount. Has latest, current news info legal filings on Michigan Vote Recount of Michigan's Presidential Election. Official! Donald Trump Wins Michigan's 16 Electoral Votes. Donald Trump will Become President of The United States on January 20 2017. Listening and Responding To Calls For an Audit and Recount Article was retweeted on Hillary Clinton Twitter. November 30 2016 Blue Collar Michigan Scholar's Michigan Election Results Michigan Recount links rap: First up. Carrier Corporation Deal With Future President Donald Trump and VP Elect Mike Pence to Keep 1000 Jobs In Indiana! Dang good news. Carrier was gonna move to Mexico. Not anymore. American Workers. One Thousand American Manufacturing J.O.B.S.! Workers keep their job in their community. 7 or 8 jobs upstream and downstream in community more secure. Family and Community more secure economically. Jobs stay in US. Paychecks in purses and wallets. Thanks, for the TRiUMPH! Awesome. What will the Michigan Vote Recount cost Michigan's Taxpayer? For various opinions type the question into Google Search, Google News Search or whatever your favorite search engine is. Michigan Republican GOP Party Michigan's Republican Party Site. Volunteer Michigan Recount. Green Party Jill Stein, candidate for 2016 President also filed Presidential Vote recounts in State of Wisconsin and state of Pennsylvania. Green Party Presidential candidate Jill Stein is leading the Michigan Recount campaign. She is responsible for $125.00 for each voter precinct. Cost estimates to Michigan Taxpayers for Jill Stein Michigan Vote RECOUNT Will be 4 MILLION DOLLARS OR MORE. Our tax dollars are better served helping the citizens of Michigan. Their families. Michigan's Community Budgets will be under further financial strain. Michigan's infrastructure. That 4 Million Dollars CAN Fill potholes, smooths roads, repairs bridges...etc. Give us Michigan Citizens and Michigan's Great Clerks throughout the State of Michigan a Break. They do a great job and service for us. Donald Trump won Michigan's Electoral Votes. They have been counted Twice, already. Michigan GOP Recount Volunteer Webpage Michigan Gop Recount Vote Volunteer site. Michigan GOP Ronna Romney McDaniels Statement on Michigan Recount MI Republican chair Ronna Romney McDaniels Recount statement. Official November 8 2016 State of Michigan General Election Results Presidential General Election Michigan General Election results November 8. Michigan Secretary of State Facebook State of Michigan Secretary of State Facebook. Ruth Johnson is Michigan's Secretary of State. Directly right from the next President himself. Trump's current opinions, views, solutions, what's happening in the world, real time. Upon Donald J. Trump winning Michigan's 16 Electoral Votes in Michigan's General Election For President on Nov. 8, thought it would be cool to revisit Trump's campaign pics from the 2015 to 2016 election campaign rallies. Donald J. Trump photo gallery from Trump for President official site. Blue Collar Quick Summary Lookback and Foward concerning Election 2016 and 2017. Donald Trump won 306 Electoral Votes. Hillary Clinton won 232 Electoral Votes. Donald Trump won State of Michigan Republican Primary Election. Bernie Sanders won State of Michigan Democrat Primary Election. Nov. 26 '16 Blue Collar Michigan Scholars Presidential State of the Union Speeches link. American Presidency Project Presidential State of the Union Speeches Transcripts This great website has text, transcripts from American Presidents George Washington to Barack Obama. Wonderful histories of their outlooks, goals, visions, solutions, opinions concerning our Great Country. Soon to be President Trump's (Sworn in/Takes Oath of Office on January 20, 2017) State of The Union Addresses will join the other Presidents' State of the Union Addreses to the Nation. President Donald J. Trump's 1st State of the Union address as President of the United States of America will be widely watched and viewed nationally and globally. President Trump's First State of the Union speech will break the record for viewership ratings. Happy Thanksgiving November 24 2016!!! Donald Trump Won Michigan's 16 Electoral Votes. 306 Electoral Votes, To Be Exact. Win the Presidency of The United States of America. His competitor Secretary of State Hillary Clinton Received 232 Electoral Votes. Congratulations to Secretary Hillary Clinton for Running a Hard Fought Campaign, Service to Our Country, and for her Graciousness in Conceeding the 2016 Presidential Election to Donald Trump. Havent heard hardly any talk on Tv tube about Mr. Trump's Inaguration January 20, 2017. Dont watch alot of Tv cable views news nowadays. Too many opinions from talkers without journalism degrees. Be cool to know who they voted for in last 3 Presidential elections so one knows where they stand. Alas, that ain't gonna happen. But it's pretty easy to figure out without them telling us who. Ain't it? Great reading. Joint commitee. Lists their responsibilities. Past Presidential Inauguration celebration. JCCIC Twitter Joint Inaugural commitee Twitter. The Whole World will be Watchin'! This Presidential Election is One for the Political Science History Books. Donald J. Trump 306 Electoral Votes. Trump won Michigan Ohio Pennsylvania Wisconsin Manufacturing Belt States and other Great States of Our Country. Donald J. Trump Wins and is President Elect and Mike Pence is Vice-President Elect. Donald Trump will take Presidential Oath of Office and be sworn in on January 20, 2017. Twitter Video Message President Elect Donald J. Trump President Elect Trump's Twitter Video Message to the nation of what he is going to do for America. Transition 2017 You Tube President Elect Donald J.Trump President Elect Donald J. Trump First Transition 2017 Video Message. GreatAgain.gov Transition 2017 President Elect Donald J. Trump & Vice-President Elect Michael Pence Official Website. Transition 2017 Video Message is here. Monday Nov 21 2016 Michigan's Blue Collar Scholar's Thanksgiving Week (man, miss that warm Michigan weather already!) Black Friday shopping deals savings fast approaching in Michigan, adding a kickstart to our Michigan economy. Great buys! Creates Jobs, for our local Michigan economy, too. Money saved...those extra Alexander Hamilton's (President on 10 dollar bill, nickel), Abraham Lincoln's (President on $5 bill, penny), George Washington's (President on One Dollar bill, quarter). Heck, Michigan Black Friday deals might be so great might save a few Andrew Jackson's (President on $20 dollar bill) Ulysses S. Grants (fifty dollar bill President) or even greater deals saving some Benjamin Franklin's (never President, $100 dollar bill). Dollars saved buys more gifts. That's more Change and Dollars we can believe in our purses and wallets! A fancier meal. Night on the town with your better half. Can't forget important one...a few more gallons of gas for our ride! Like the price around 2 dollars per gallon! You, too? Cool! Oh, also Thomas Jefferson is President on $2 bill and New Deal President FDR Franklin Delano Roosevelt is on the Dime and is cousin of Republican and Bull Moose Party TR... President Theodore Roosevelt. By the way, Theodore Roosevelt won Michigan's Primary election votes and Michigan's General election electoral votes over a 100 years ago! Not the Michigan Blue-Collar Scholar for nothin'! Read All About It! Current Trump Transition News Remarks Statements From Official Trump Transition Site. News, statements, remarks concerning people interviewing for President Elect Trump's Administration 2017. Great Again Presidential Transition 2017 President Elect Donald J. Trump Homepage Official Website to keep informed directly from Donald Trump. President Elect Donald Trump just released his First Transition 2017 Video Address. It is posted on the Transition 2017 website. Democrat Party Future Trump Win Clinton Loss. Bureau of Labor Statistics Midwest Michigan Region Statistics Michigan's Monthly Stats. Michigan's CPI Comsumer Price Index, Michigan's unemployment employment statistics in various jobs and careers. View the trends. See other US states labor statistics. Click "Data Tools" link at top of page for more subject matter. Great Job! Nov 18 2016 Blue-Collar Michigan Scholars TGIF Greetings from Manufacturing Belt State Michigan! at a Christian Science Monitor Breakfast Nov 17 2016 before reporters from various media. Senator Bernie Sanders Discusses Election Results Trump Presidency Cspan vid. Christian Science Monitor Breakfast. Independent Senator Bernie Sanders speaks about 2016 Presidential election over breakfast with reporters. Also, discusses why, in his opinion, Democrat Party suffered major losses in 2016 U.S. President race with Donald Trump U.S. House of Representatives Seats, U.S. Senate seats, State House and Senate Seats and Governorships throughout the Country to the Republican Party this year and over last few years. Bernie takes questions from reporters. US Election Atlas Results Dave Leip's US Election Atlas results website has latest data, statistics, results, electoral maps, popular votes on 2016 Presidential Election and other elections in 2016 and past years United States Presidential and other elections. Site provides historical perspective at a glance. Great job! Michigan's Popular Votes? Trump Trumps Clinton. 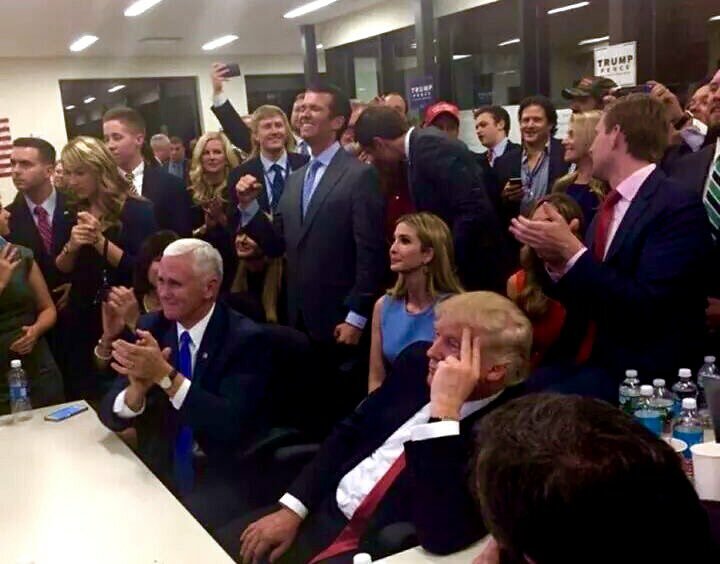 Donald Trump Mike Pence Family - Team Trump View November 8 2016 Presidential Election as it plays out on Television Broadcast. President Elect Trump 306 Electoral Votes. 232 Electoral Votes Hillary Clinton. Hillary Clinton called Donald Trump and graciously conceeded the 2016 Presidential Election according to President Elect Trump. November 20 2016 Alexander Hamiton Library of Congress Archives Alexander Hamilton Library of Congress Archives. C-Span website. Feed of Trump Tower Lobby. Blue Collar Michigan Scholar's Answer to The Questions Who Won Michigan's Popular Vote in Presidential Race 2016? Did Donald Trump Win Michigan's Popular Vote? Did Hillary Clinton Win Michigan's Popular Vote? Answer: Donald Trump Won Michigan's Popular Vote. Donald Trump Wins State of Michigan's 16 Electoral Votes. Michigan Popular Votes President Trump Clinton 2016 Michigan Secretary of State, Ruth Johnson Website Current Results General Election 2016 U.S. Presidential House Senate State Candidates Popular Vote Results Total. President Elect Donald Trump Won Michigan's Popular Votes. President Elect Donald Trump Wins the Great State of Michigan's 16 Electoral Votes. Mr. Trump's Official Presidential Transition Website. Website(s) For Presidential Transition News Officially from President Elect Donald J. Trump. President Elect Trump GreatAgain.Gov TRADE REFORM POLICY Transition 2017 Jobs Jobs Jobs for Michigan and Our Great Country. USA! President Elect Trump's Transition 2017 Official Twitter. November 16, 2016 Blue Collar Michigan Scholar's Maps, Maps and More Maps Elections 2016! What states voted Democrat? What states voted Republican? What states voted for Donald Trump? What states voted for Hillary Clinton? How did the states electoral map of U.S. change over the years party wise Republican or Democrat? These maps are awesome. 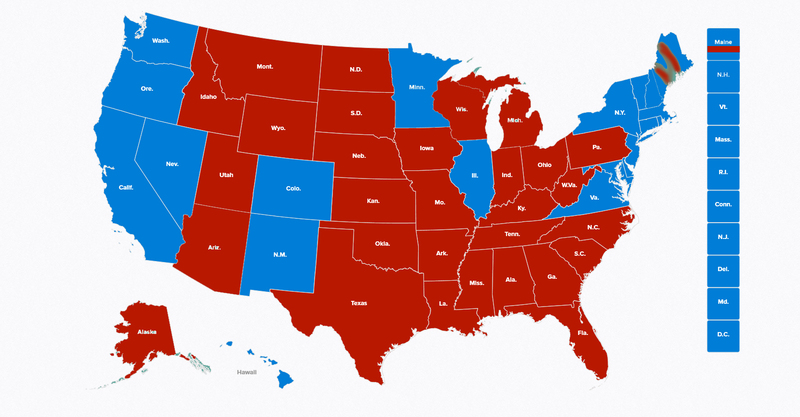 With a quick glance at the maps, one immediately sees the outcome of the 2016 Presidential Election nationwide. Red represents Republican and Blue represents Democrat. Maps Of The 2016 Presidential Election Results Cool Maps of Results of 2016 Presidential Election. Election results by states and counties. Maps from University of Michigan. Great college in Michigan. Electoral Maps 2016 Elections Results 2000, 2004, 2005, 2006, 2008, 2012 Map 2016 Elections and links to election results maps from 2000, 2004, 2005, 2006, 2008, 2012. Cartograms maps election results are fascinating. Maps from Princeton University. Great college.